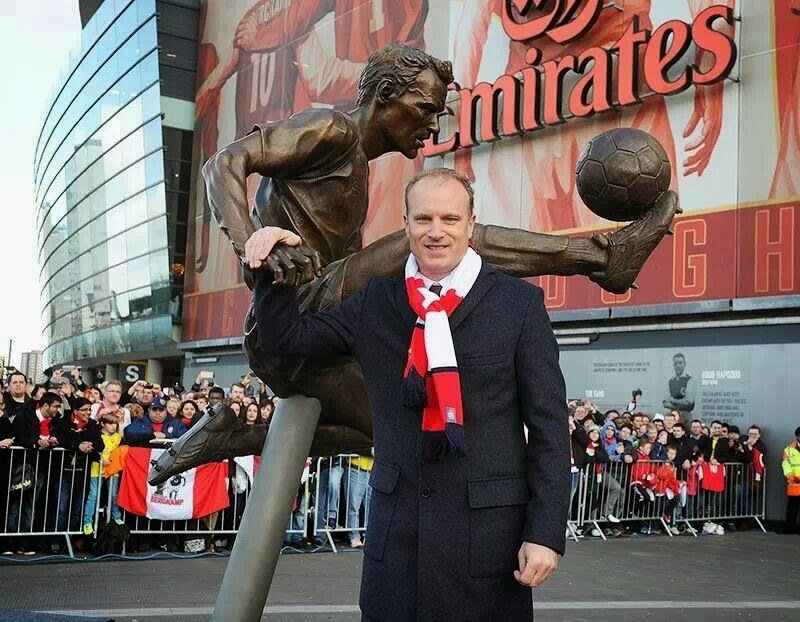 It always seemed a touch odd that Henry got a statue before Dennis Bergkamp did, as the Dutchman's career at Arsenal preceded the Frenchman's slightly. Obviously Thierry Henry's goal scoring record at the club had a big impact, but, depending on what generation you ask, I think a lot of Gooners would say Dennis Bergkamp perhaps had a bigger impact on the club as a whole. It was 1995, and a bank manager-looking man and Arsenal manager at the time, Bruce Rioch convinced Bergkamp to leave his troubles behind him at Inter where he didn't quite find his comfort zone, and travel to a somewhat struggling North London team, Arsenal. We'd just finished 12th the season previous, our worst league performance since the mid 70's, and the fans were demanding improvement. I don't think one Arsenal fan, or even football fan, expected us to land one of the hottest (literally and figuratively) forwards in the game at that time. A now modest £7.5million (a club record at the time) got the Dutchman in Red & White, with his best years clearly ahead of him. Something that helped Bergkamp earn the fans' adoration so quickly was, perhaps the stunner he had hooked on his arm when he walked into the Marble Halls. Have a footballer, no matter how good he is, show up with a dog or diesel dyke by his side and he's instantly got a mountain to climb. It's a funny thing, football, but you've got to represent properly. Funnily enough it took Bergkamp a long while to get onto the score sheet for Arsenal. It wasn't until his eight game in the number 10 shirt, against Southampton, that he recorded his first two goals for the club. Scoring wasn't an issue after that, and 'God' as he's affectionately referred to in the stands, is responsible for some of the finest and most spectacular goals by any player, let alone any Arsenal player. He made the hoop socks of the mid 90's look cool and will always be an Arsenal legend. A well deserved statue. Future Arsenal manager...? Believe it or not, after the Dennis Bergkamp statue was unveiled there was a football match between Arsenal and Sunderland. As expected, Ozil was rested, not even making it to the bench. I don't think there's too much to read into with this, as he was probably due a rest anyway. Giroud came back into the squad and hopefully Ozil will come back form his rest just like Olivier came back from his. Two goals (two nice goals) form the Frenchman will no doubt help his confidence in what is approaching the final run of the season. One of my favourite Arsenal players, Tomas Rosicky got a wonderfully worked goal as well, and a classic Arsenal goal at that. Some ticky tack passing between himself, Cazorla, Wilshere and Giroud led to a beautiful chip over Mannone. If you haven't seen it, it's well worth a watch. It was suggested that Sunderland were perhaps overly cautious throughout the game due to their Capital One Cup final this week, and it was painfully obvious when Koscielny rose, un challenged to emphatically head in our fourth from a corner. A good reaction, as I suppose a reaction was exactly what we were looking for, and hopefully this is the start of another run of good form. There's very rarely an 'easy' run of games, and the next few are hardly that either. We go to Stoke this weekend, which is like traveling to the zoo and watching our boys play a congress of orangutans with abnormally high testosterone levels but very poor motor skills. Next comes the 2nd leg of the Bayern match up, and while it wouldn't be the end of the world if we got knocked out so we could channel our focus elsewhere, I still think there's no other option than for our best available 11 to go out there and play their nut sacks off and win 3-1. After Germany is when it gets tricky. The blokes who spent over £100million on "talent" this past summer and play in a stadium that resembles my toilet 35 minutes after I eat from crappy Indian restaurant at the top of my street. After we play Tottenham, the team that always finished below us, every... single.. year, we travel to Fulham to play a game against Chelsea. This game will be very, very interesting and could be pivotal in our title challenge. The same can be said about the next game, when we welcome Manchester Citeh, currently the best team in Manchester, to The Emirates. While many of us would rather stab ourselves in the eye with rusty nails than watch John Terry run around trying to kick people the ball, I think I'll make sure I catch this one. A week of rest then off to Stoke - the sweaty, dirty taint of England. A return for Ozil and hopefully this rest will get him where he needs to be to start performing again.